TORONTO -- General Motors must restore hundreds of jobs being cut at a southern Ontario assembly plant or risk failing to reach a new contract with the factory's workers this fall, the president of Canada's largest auto workers union says. In an unexpected decision, GM is cutting 625 jobs at its CAMI auto assembly plant in Ingersoll, Ont., by the end of July as it phases out production of two current generation vehicles and moves some work to Mexico. The move to shift some jobs to Mexico comes at a time when U.S. President Donald Trump has urged auto executives to build more American plants and invest less in Mexico. Securing jobs will be key to a collective agreement to replace the one expiring in September between GM and its 2,800 CAMI workers, said Unifor president Jerry Dias by phone. While Dias expects Ingersoll negotiations to begin in late summer, Unifor is already raising pressure on GM to restore the jobs at the plant, which built 310,000 vehicles last year. "We're going to have to find a solution," said Dias. "And we're going to have to find a solution now, as opposed to waiting for September." Dias has blamed the North American Free Trade Agreement (NAFTA) and Mexico's lower labour costs for the job losses, which it called unjustified given strong sales of the Chevrolet Equinox crossover and GMC Terrain SUV assembled at the plant. The next-generation Equinox will be built at CAMI, while the new Terrain will be manufactured in Mexico. CAMI is the plant which produces the most Equinoxes, GM's top-selling crossover, said Joe McCabe, president of AutoForecast Solutions LLC. "If they strike there and the majority of Equinoxes come out of CAMI, that gives Unifor some power," he said. 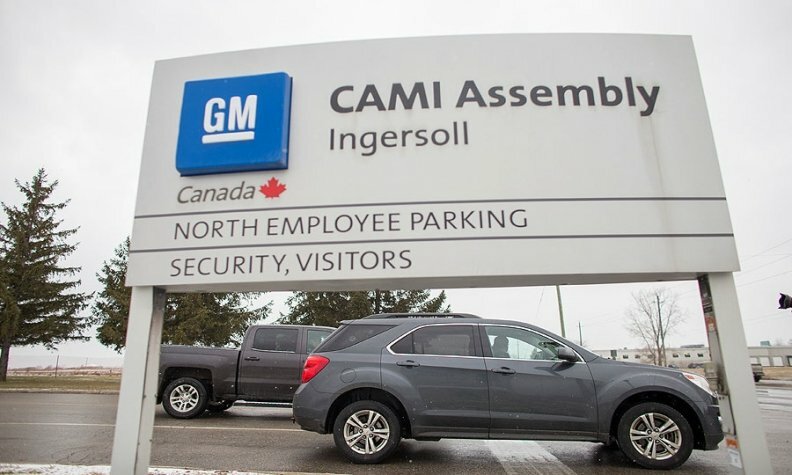 Ingersoll was not part of a four-year labour deal the union negotiated with GM Canada last September, which secured $554 million (US$422.6 million) of investments for other plants. Steve Carlisle, managing director of General Motors of Canada, said Ingersoll jobs would be discussed with Unifor in the runup to bargaining. "Obviously, any time there are job losses, there are concerns about that and how we might offset those," he said. "We expect to have conversations about those things when the time comes."